Musings on Markets: Deconstructing Amazon Prime: Loss Leader or Value Creator? Deconstructing Amazon Prime: Loss Leader or Value Creator? Update (October 17, 2017): One of the things that I enjoy most about posting my valuations online is the feedback and how much I can use that feedback loop to improve my valuation. There are three changes that I have made to my Amazon valuation, though the end number that I get is not that different. First, as many Prime members outside the US have pointed out, the cost of Amazon Prime is less than $99/year in many countries, ranging from $22/year in Italy to just over $50/year in Germany to only $8/year in India. That lower annual cost will bring down the value of a member (existing and new). To allow for that, I have replaced the $99 annual fee that I had used in my valuation with $93.78, a weighted average of the fees, allowing for the one quarter of Prime customers in the US who have monthly subscriptions (and pay more) and the 20% of customers outside the US (my estimate), who pay, on average, about $50/year. Second, as some of you have noted, my operating margin was computed prior to just shipping costs and that I am double counting the customer service and media costs, which should also be added back. That increases my operating margin to 12.11% from 9.19% and I will assume that it improves to 13% over time. Third, and this was entirely my mistake, my value per existing member did not factor in the drop out rate and that has been fixed. I am an Amazon Prime member and have been one for a long time, and I am completely hooked. Not only do I (and my family) use Amazon Prime for items ranging from tissue paper to big screen televisions, but it has become my go-to for every possession that I need in my working and personal life. In fact, I know (and am completely at peace with the fact) that it has subtly affected my buying, as I substitute slightly more expensive Prime items for non-Prime equivalents, even when I shop on Amazon. It is not just the absence of shipping costs that draws me to Prime, but the reliability of delivery and the ease of return. In short, it makes shopping painless. As I tally how much we save each year because of Prime and weigh it against the $99 that we pay for it, I am convinced that we are getting far more value from it than what we pay, and that leads to an interesting follow up. If many of the 85 million other Prime members in October 2017 are getting the same bargain that we are, is this not an indication that Amazon has not just under priced Prime, but is perhaps selling it below cost? As someone who has wrestled with valuing Amazon over the last 20 years, I have learned never to under estimate the company. In this post, I would like to take the process I used to value a user at Uber and apply it to value not just a Prime member to Amazon but the collective value of Amazon Prime to the company. In fact, the jump in members in the last three years is particularly impressive, given how much bigger the base has become. In 2016, the company added almost 20 million new members and is on pace to add a similar number this year. 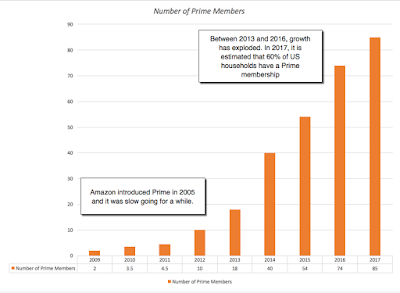 In October 2017, the company’s mammoth Prime user base meant that almost 60% of all US households had memberships, suggesting that a non-Prime member is more the exception than the rule for Amazon’s US operations. Growth has been slower outside the US, slowed both by competitive/regulatory pressures and logistical challenges. To understand how Amazon Prime works, let’s break down the mechanics. Any one (in the countries where Prime is offered) can become a Prime member, either on a monthly or an annual basis. In the US, in 2017, the annual fee for membership was $99, as it has been for the last few years, and the monthly fee was $10.99. With 85 million members, that translates into a total revenue for the company of over $8.5 billion; the monthly members pay more but there is a portion of the membership (including students) who get discounted memberships. The other benefit for Amazon, though, comes from the fact that Amazon Prime members spend more on Amazon than non-Prime members. While the exact numbers are known only to Amazon, the most recently leaked reports suggest that the typical Prime member spends approximately $1,300/year on Amazon products, as opposed to the $700 spent by a non-Prime member. While it seems obvious, then, that Prime membership leads to more spending ($600, if you believe these two numbers), the statisticians will raise red flags about sampling bias since the true incremental revenue is unobservable; it is the difference between what the existing Prime members are spending ($1300/year) and what those same members would have spent, if they did not have Prime memberships. That is a reasonable point, but there is clearly a Prime impact, where Prime members choose Prime items over less expensive non-Prime offerings on Amazon, just as I do. The biggest cost, by far, to Amazon is the shipping cost that the company now bears on Prime items. In 2016, the company reported net shipping subsidy costs of $7.2 billion (in the footnotes to the 10K) and assuming that almost all of these costs were related to servicing the 60 million members that Amazon had in 2016 leads to a per-member shipping cost of close to $120/ member. The other free services that Amazon offers its Prime members also create costs, though those costs are embedded in larger company-wide items and are more difficult to separate out. The company expends administrative costs in providing additional customer service to its Prime members. These costs are part of the total G&A cost of $2,432 million that the company reported in 2016, but we will assume that the servicing cost per member was $10 (or $600 million in the aggregate in 2016). The company also buys some content for its media and Kindle reading sections specifically to back up its Prime membership. Again, that cost is part of the $16,085 million that the company as its technology and content cost in 2016 and we will assume that 10% of those costs (approximately $1.6 billion) can be attributed to Amazon Prime. There is one final component of cost that we would like to know, but have to guess at and that is the cost to Amazon of acquiring a new member. That promotional/marketing cost is part of the total marketing cost of $7,233 million that Amazon reported in 2016 and we will assume that this cost is $100/member; in 2016, this would have translated into a total cost of $2 billion to acquire 20 million new members, leaving the remaining $5.2 billion in marketing costs as conventional advertising/marketing cost. Pulling all these numbers, real and imagined, into a picture, here is what we get as the economics of an Amazon Prime member. The closing statistic that is worth emphasizing here is that once someone becomes an Amazon Prime member, they tend to stay as members with an annual renewal rate of 96%. Renewal Rate: We will assume that annual renewal rates will stay high, at 96%, since the subscription model and the dependence on free shipping makes dropping the service difficult to do. Incremental Revenue/ Member Growth: As Amazon looks for new products and services to sell its Prime members, we will assume that the company’s legendary marketing skills will work and that the incremental revenue (which we estimated to be $600 and attributed entirely to Prime membership) will grow 10% a year for the next five years. That growth rate will scale down to the inflation rate (1.50%) in year 10, but that cumulated effect will result in incremental sales of $1,275/member in 2027. Operating Margins on revenues: To estimate the operating margin on revenues, I started with Amazon's operating margin but then added back the shipping, customer service and Prime media acquisition costs, since I treat them as separate costs. The resulting margin is 12.11%. Shipping Costs: The biggest cost to Amazon is shipping and much of what the company seems to be doing both in terms of new investments (in distribution centers, trucks and drop off locations) and acquisitions (Whole Foods) seems to be designed to keep these costs in check. We will assume that shipping costs will grow 3% a year for the next five years (well below the incremental revenue growth), before settling into growing at the inflation rate thereafter. Customer Service Costs: The cost of Prime member customer service will increase 5% a year for the next 5 years and the inflation rate thereafter. Risk and Cost of Capital: I will assume that Amazon’s overall cost of capital applies as the right risk adjusted rate to use on all of its member valuations, since they partake in its entire product line. That cost of capital, in October 2017, given a US treasury bond rate of 2.35% was 8.00%. Growth in incremental revenues: Getting Amazon Prime members to buy more products and services is key to their value and it should be no surprise to see stories like this one. As revenue growth climbs from 10% to 15%, for instance, the value of an existing member becomes $744 and the value of member base increases almost 65%. Keeping shipping costs contained: The key to extracting value from Prime members is checking shipping costs. To illustrate, if shipping costs grow at the same rate as incremental revenues do, the value per member collapses to $71.50. Viewing Prime members through this prism makes it easier to explain the Whole Foods acquisition, by Amazon, for about $14 billion. Rather than think of it as Amazon’s entrée into a low-margin, intensely competitive grocery business, it would make more sense to view it as an acquisition of a distribution system (of 460 Whole Foods stores, in prime locations) that will reduce shipping costs in the future, while also providing a new menu of products/services that can be offered to Prime members. That is bad news for a whole host of other players in the market but that is a story for another day. To get from the value of an existing member to that of a new member, you need to have a measure of how much Amazon is spending to acquire new members. As I noted earlier, the company is opaque on this issue, though I would hazard a guess that it is a much more onerous number outside the United States. If you work with my guess of $100/new member as the base year number, we need only one more estimate to get to the value of new members and that is the growth in the membership base. Given the success that the company has shown on this front in the last five years, we will assume a growth rate of 15% for the next five years (which will bring Prime membership to 155 million in 2022). Given that large base, we will scale growth down to 5% a year from years 6-10 and to 2.25% a year thereafter. Again, with our estimates, the value of new Prime Members is approximately $53.9 billion and that number, in addition to being sensitive to our estimates of growth in members, magnifies the effects of incremental revenue and shipping cost growth that affected the value of an existing member. Thus, setting shipping costs to grow at the same rate as incremental revenues makes the value of new members a negative number, suggesting that growth will become value destructive if shipping costs are not brought under control. In effect, we will lower the value of Amazon Prime by $32.8 billion to reflect these additional costs. Note that though I treat this cost as a drag, it is not wasted, since it is the additional media that is being offered as a sweetener for existing Prime members to stay on and new ones to join. I know that I have made a multitude of assumptions along the way to get to this value and that you may disagree with many of them. As always, you can download my spreadsheet and make the changes that you think need to be made. If you work at Amazon or view yourself as an expert on Amazon (I am not), your numbers should be much better than mine, and I would hope that your valuation will reflect the better information. While I have made a few optimistic assumptions to get to the value of Amazon Prime, I believe that there is an additional value that I have not counted in. Amazon is building a base of loyal, intense members that it can draw on to promote whatever its next product or service is, whether it be in retailing, technology, entertainment or cloud computing. That value is what you could call a real option, though those words are used far too frequently in places where they should not be, and that real option may be Amazon’s ultimate wild card. I have long described Amazon as a Field of Dreams company, one that goes for higher revenues first and then thinks about ways of converting those revenues into profits; if you build it, they will come. In coining this description, I am not being derisive but arguing that the market's willingness to be patient with the company is largely a the result of the consistency with Jeff Bezos has told the same story for the company, since 1997, and acted in accordance with it. Amazon Prime symbolizes how Amazon plays the long game, an investment that has taken a decade to bear fruit, but one that will be the foundation on which Amazon launches into new businesses. I know that there are many companies that model themselves after Amazon, but unless these "Amazon Wannabes" can match its narrative consistency and long time horizon, it will remain a one of a kind. I feel there is something wrong with your terminal value calcualtion for the new users. I see that you are using total number of prime members to compute your terminal value of new members! Is there a reason for using total prime for computing terminal value of new users using total prime members in year 10? 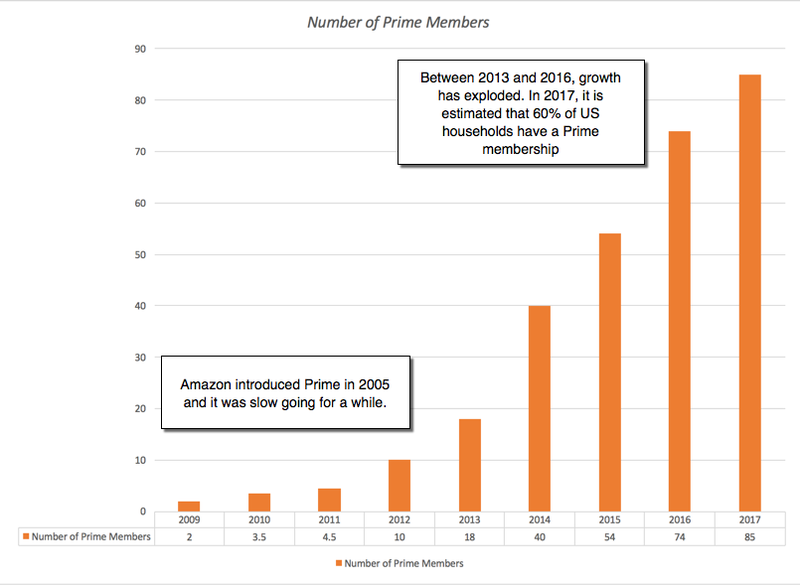 Shouldn't this just be an incremental number of new members that have been added over a period of 10years rather than total prime members? Hi Prof. Quick qn (open to others explaining this as well) - If you have already used operating margins to calculate the value of a current user (which would include the marketing/acquisition cost), why is there still a need to subtract the $100 cost of acquisition for new users? If it's argued that the operating margin does not take into account cost of acquisition, should you not subtract cost of acquisition for the existing customer base as well? Thanks! I start with the total number of users but I then estimate the number of new users by multiplying by 2.25% (set equal to the risk free rate = growth rate in perpetuity). It is that incremental user value that I use to compute terminal value.